Can you recall eating a peach so ripe and perfect that the juices dribbled down your chin, and your tongue savored each incredibly sweet bite? I simply can’t get enough of peaches at the moment. I believe they’ve even risen above raspberries to the status of “favorite.” Maybe it’s the lingering summer we’re having here in Northern California, or perhaps it’s just the association with summer. When I think of peaches, I think fresh peach pie, strolling through fruit orchards and warm afternoons. I buy them hard as apples and let them sit in a shallow bowl on my counter, checking them every day in anticipation of perfect ripeness. I had a love/hate relationship with peaches as a child, because I had an aversion to the fuzzy skin, and because I don’t recall them tasting particularly juicy and sweet unless they were baked in a pie. (Probably because my mom tended to buy them on sale in chain grocery stores where the fruit was often unspectacular.) Of course, now, I buy gorgeous specimens from places with names like “Frog Hollow” and “Hidden Valley Grove.” How could you not like a peach from a sweet little organic farm nestled in a cozy valley–at least the image of which is conjured up in your mind with the likes of those names? I keep longing for a peach pie, but since I’m back on my “close to no-,” but not quite no-gluten, kick, I haven’t made one. Instead, I settle for fresh-sliced chunks in my bowl of porridge with a little coconut milk to boost the creaminess. I also serve them up regularly with my kids’ meals, and watch while they make these silly expressions of ecstasy while eating the juicy chunks. 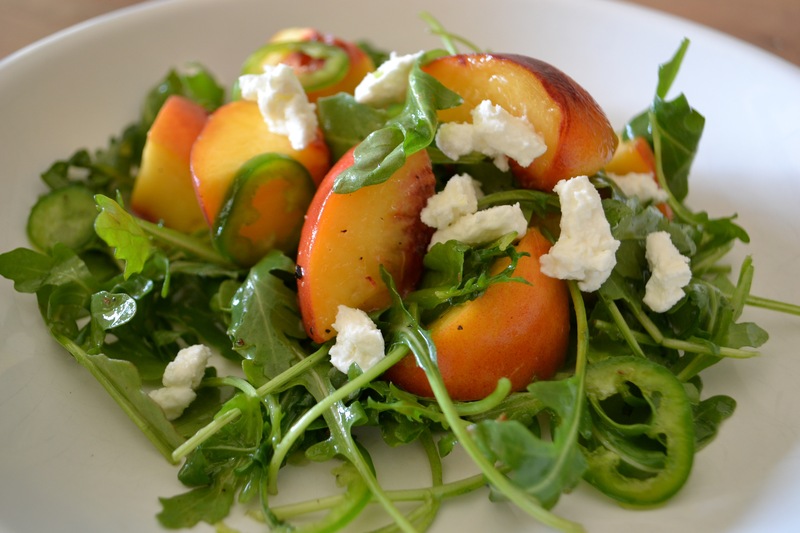 I threw together this salad using peaches, and loved it. It sports a nice combination of flavors, textures and colors, and would go very well with a flavorful meat dish, such as skirt steak in chimichurri sauce or a marinated roasted pork loin. Since I don’t eat mammals, I just enjoy the salad for it’s own sake. In a small bowl, whisk together the vinegar, honey and mustard. Whisk in the salt and pepper. While whisking, slowly pour in the olive oil until the dressing is thoroughly mixed. Set aside. Slice the jalapeno or other pepper in very thin slices and carefully remove all seeds. 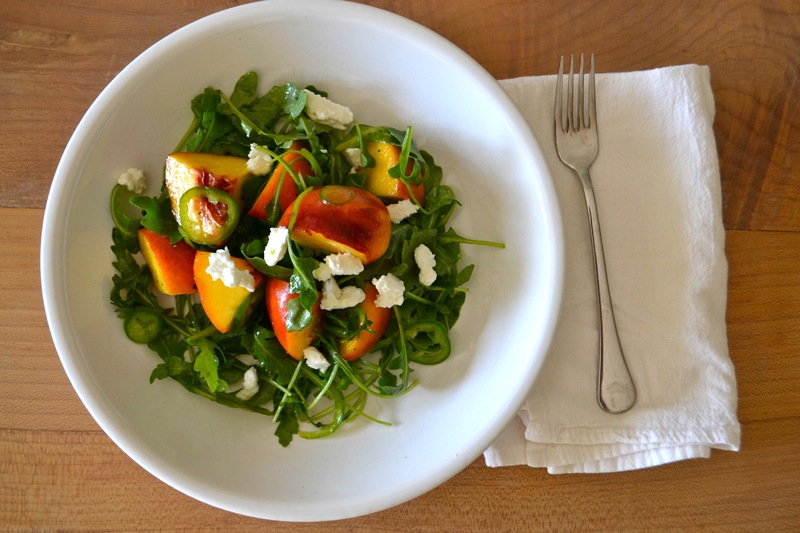 Toss together with the arugula and peach chunks. Drizzle some of the dressing over the salad mixture and toss to coat. Taste and adjust accordingly. Top with the crumbled cheese (and almonds if you’re using them). Serve immediately.